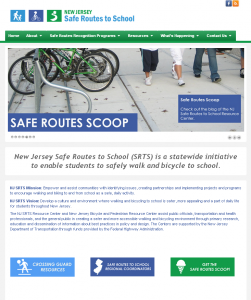 New Jersey Safe Routes to School (SRTS), which is created and supported by the New Jersey Department of Transportation with funding from the Federal Highway Administration, enables and encourages safer and more accessible walking and bicycling environments for children in New Jersey through education, training, and research. Safe Routes to School projects can involve physical improvements to the environment, as well as encouragement programs to promote more walking and bicycling to and from school. To empower communities to identify and overcome barriers to walking and cycling to school through the creation of partnerships and implementation of projects and programs that make walking and biking to and from school an appealing and safe daily activity. A culture and environment where walking and biking to school foster a safe and attractive way of life for students throughout New Jersey. The New Jersey SRTS Resource Center, which is managed out of the Voorhees Transportation Center, assists public officials, transportation and health professionals, and the general public in creating a safer and more accessible walking and bicycling environment through primary research, education and dissemination of information about best practices in policy and design. The Center is supported by the New Jersey Department of Transportation through funds provided by the Federal Highway Administration.